The Basic Market Bag … it’s Magical! | w3bCh1ck! 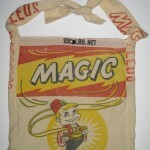 Home » Up^Cycles » The Basic Market Bag … it’s Magical! The Basic Market Bag … it’s Magical! This entry was posted in Up^Cycles on April 5, 2010 by admin. It may be a simple bag but it certainly is magical! This is one of the few reproduction bags that I’ve purchased. I really like the design & the colors and it does have that vintage feel to it. I lined the inside with a bright red cotton and the straps are a simple tie so they can be modified for length. Snap closure at the top and voila! 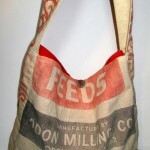 a market bag you can roll up nice and small to fit in your purse!